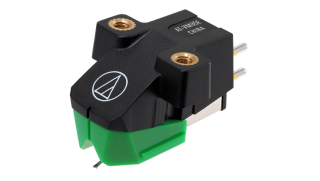 Audio Technica introduces entry-level VM95 range of cartridges | What Hi-Fi? Looking for an affordable way to upgrade your budget turntable? In addition to launching its first ever pair of true wireless buds, Audio Technica has today announced the launch of six new budget moving-magnet cartridges - one of which succeeds the company’s AT95E budget cartridge that appears on the AT-LP5 turntable we handed five stars and an Award to. Audio Technica claims the AT-VM95E (£44) improves on the AT95E’s output level, dynamic range and frequency response, with its aluminium cantilever, elliptical stylus and new coil design delivering an increased output of 4mV. Below the 95E sits the AT-VM95C (£29), which is furnished with a conical stylus plus new aluminium cantilever and coil designs. Next up are the AT-VM95EN (£99) and AT-VM95ML (£149), which feature elliptical and Line Contact MicroLinear styluses, respectively. The AT-VM95SH (£179), meanwhile, sports a Line Contact Shibata stylus. Last but not least, the AT-VM95SP (£69) has been designed exclusively for 78rpm SP records.